after making + writing about so many healthy tomato-related recipes lately, i was ready the other night for some serious meaty comfort food. i don’t know about you, but when i think meat + comfort food, the first thing that pops to mind is BACON! i had bookmarked a few bacon fried rice recipes + decided that if ever was there a time to try out those recipes, the time was now. sweet heavenly moses, did this hit the spot. the savory onions + garlic work perfectly with the salty bacon + soy sauce, while the peas + ginger add some lovely bright notes. i literally could not stop eating this, having it for dinner one night, breakfast the next morning + a late-night snack the following day. it reheats nicely (always a plus!) + pairs well with grilled chicken or fish (or your morning coffee). definitely put this one on your to-make list — you’ll be happy you did! cook bacon over medium high heat in large skillet until browned. drain all but two tablespoons of fat from pan + add onion, scallion. cook until softened, stirring occasionally, then add the garlic + cook for 1 minute more. add frozen peas + cook for another 2-3 minutes. transfer mixture into a bowl. in the same skillet, lower heat to medium, add eggs + scramble. add eggs to the bowl with the bacon mixture. wipe out any residue from skillet + add 2 tablespoons of vegetable oil. turn heat to medium high. when oil is hot but not smoking, add cooked rice in an even layer in the pan. let rice sit, stirring occasionally, to allow it get brown + somewhat crispy. stir in bacon/onion mixture, egg, + soy sauce. remove skillet from heat + serve immediately. This looks SOOO good … I need to try making this ASAP! I made a healthy fried rice…and then discovered how insanely delicious it is with bacon. So much for healthy, but it’s totally worth it! Yum! I love making homemade fried rice…and I love bacon!! Definitely going to try this next time! this was my first time making homemade fried rice + i was surprised at how simple it was. definitely adding fried rice to my easy-to-make side dish list! The recipe is much simpler than i imagined after reading the title. I love it! Asian dishes can be so complicated & require items i rarely use. I REALLY appreciate that this one doesn’t require me to drive across town to the Oriental Grocer haha! It looks delicious Amy. ally, it was super easy + amaaaazingly delicious. i didn’t even need to go to the store since i already had every ingredient in the house. win! I’m loving it! We make fried rice often at home, but I never thought of adding bacon. My husband is going to love this idea (he LOVES bacon but rarely gets to eat it since I do the shopping and typically buy turkey bacon–I know, soooo not the same). Can’t wait to try this! i tried to like turkey bacon but haven’t been able to yet – maybe i just haven’t found the right brand. =) definitely give this a try for your husband – i wasn’t sure how it was going to turn out, but it honestly turned out amazing, way better than i expected! maris, it’s delicious! you have to try it! This is fantastic.. I can’t wait to try this! That sounds really good. Bacon, eggs, onion, peas, rice, and not to mention I love ginger. A lot of things all combined that I like. 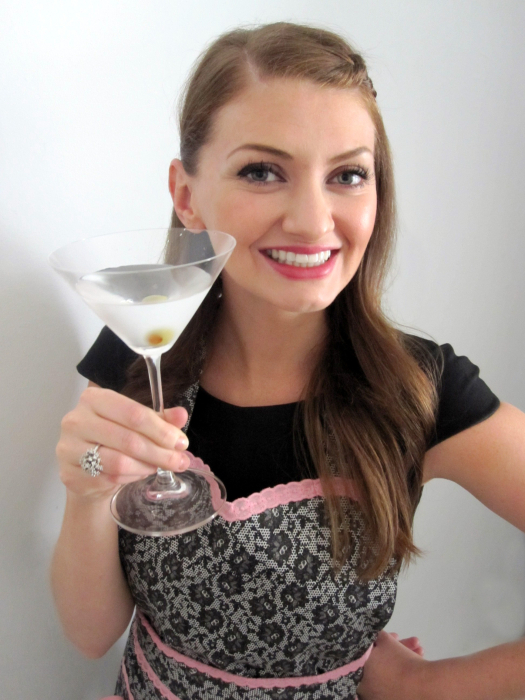 ditto – i love all the ingredients so i almost always have all of them in the house. extra perk of this dish — no need to go to the store for ingredients! i can’t wait for you to try it either! Girl,ya had me at BACON!!! !I would totally eat this for breakfast with a nice fried egg(or two)right on top,Yummmmy. super idea! My kids will be all over this one! They are obsessed with bacon. But really, who isn’t? i know that i am! bacon definitely makes everything a little bit better. Ooh decadent! And oh-so genius! it’s decadent + indulgent indeed. you gotta treat yourself sometimes! YES!! 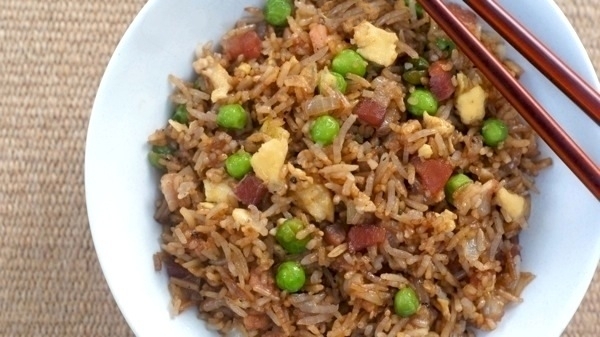 My hubby loves ham fried rice – so why not bacon? Everything is better with bacon!